It is heartening to see Brian Rudman slamming the Historic Places Trust's u'turn on the Queens Wharf sheds as a "shameless surrender". Which it was. And hopefully the HPT will re-read the Historic Places Act, remind themselves what they are there for, and do the right thing before it is too late. But the HPT's "shameless surrender" pales into insignificance alongside ARC's shameless self-interest when it comes to Queens Wharf and the Auckland waterfront as a whole. 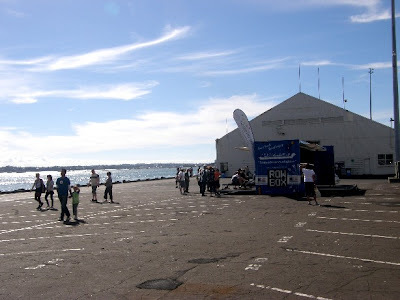 If Queens Wharf was a Regional Park - and the chairman Mike Lee has spoken of Queens Wharf as "ARC's 28th Regional Park" - then all the buildings on it would have automatic protection. That's why Auckland has Vaughan's Homestead, Couldry House, and many other historic buildings, plus a host of fantastic and iconic baches dotted around the coastline. These buildings have huge protections against demolition. So it would have been good for the historic buildings on Queens Wharf if the ARC's Chairman had put his fine words into action. But Queens Wharf is not an ARC Regional Park - more's the pity - and it formally came into the ownership of ARC and the Crown on April 1st. April Fools Day. The previous piece of surplus ports assets that came into direct ARC ownership was land and wharves at Tankfarm aka Wynyard Quarter or Western Reclamation. I remember well when ARC councillors had the first opportunity to walk around and admire and examine this new acquisition. Councillors could see lots of possibilities - ranging from the huge waterfront development through to the heritage trail and tourism opportunities and vernacular industry like fishing and boat building. The first advice we had was that the land zonings needed to change to allow these new activities to occur. So Auckland City Council notified a plan change related to its District Plan controlling what can happen on the land, while ARC notified a plan change related to its Regional Plan Coastal controlling what happens on the coastal edge and on the wharf structures. It is important to appreciate that while the freehold title of the land transferred to ARC, many private businesses and individuals had leases and other arrangements for the buildings and structures on the land and wharves. These property rights needed to be recognised in the Plan Change. In the course of our walk we saw lots of buildings of character - some of them elegant - like the Sanfords Buildings, but most of them very workmanlike. Sheds in fact. Because of the zoning on the land and the wharves - any of these buildings could have been demolished as of right. They had no protection. The ARC commissioned heritage advice on some buildings, and submitted to ACC's plan change that a group of identified buildings should be protected against demolition. It cited the heritage and character assessment in its evidence. Remember - the ARC did not own any of these buildings. They are all privately owned. I would particularly ask you to take a look at Building 2 (the net shed or fisherman's shed), and also at Buildings 8, 11 and 17. They are all sheds and warehouses. The ARC has gone to war - as much as it can - to protect these warehouse like sheds from demolition by arguing they need to be included in the list of scheduled and protected buildings. Some of these buildings were built before World War II. So they are pre-war. 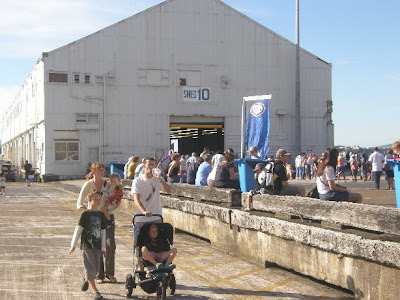 But they are children compared to the grand-daddy old sheds on Queens Wharf which were constructed before the First World War. The question is: why is ARC being so inconsistent in its behaviour on Queens Wharf? The answer to that question is simply that ARC has always wanted it for Auckland's Premier Cruise Ship Terminal, and that has pre-determined its actions. The Port company never wanted to build a cruise ship terminal on Queens Wharf. Its argument is that there is not enough money to be made from cruise ship fees to justify the capital cost of construction of a major terminal. 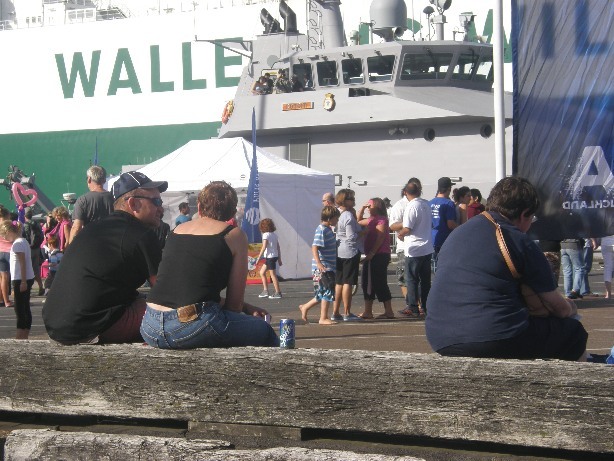 The ARC has had advice that there are other economic benefits from cruise ship visits - that passengers shop downtown and spend their dollars in Auckland. That's true. Unfortunately the same can be said of container ships. Today Ports of Auckland hardly makes a bean from container handling because such a low rate was negotiated with Maersk. 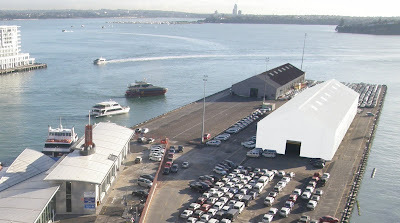 And while there are wider benefits to businesses reliant on getting goods in and out, the Auckland community has to put up with stacks of containers on prime waterfront land, and has their arterial roads jammed with huge trucks. 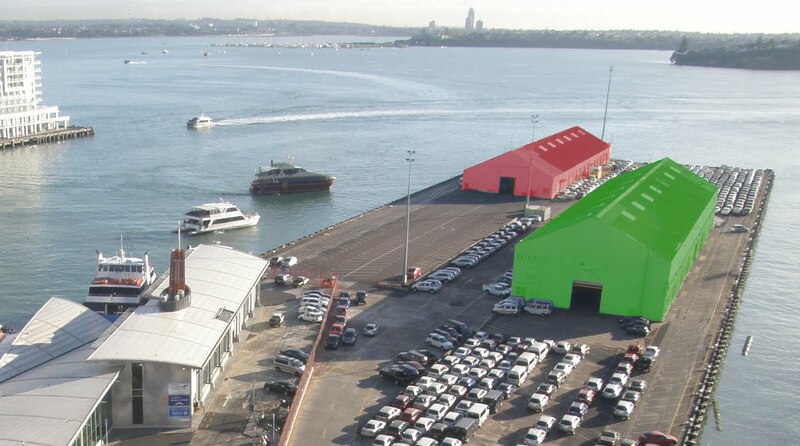 The ethical question is this: just because the ARC can legally demolish the sheds on Queens Wharf (because it has not carried out the same plan change process it led at WYnyard Quarter based on the same regional policies), does that mean it is appropriate and right for it to demolish them? Just because it is hell bent on building a "world class" cruise ship terminal there? Especially when you consider that ARC commissioned a substantial Heritage Assessment which has rated both sheds and wharf as of "high significance". 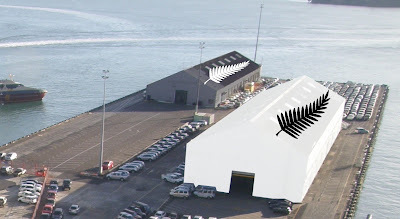 And that this same assessment and countless other suggestions from architects in their design competition entries have shown how the sheds could be incorporated into a perfectly serviceable and attractive building that can be used for cruise ships and for public purposes. I end with this sad reminder of ARC's involvement in waterfront development. The annual Auckland Regional Council rates revenue from Princes Wharf is $225,000. What fantastic weather there was for the public opening of Queens Wharf as a "Peoples' Wharf" by ARC Chairman Mike Lee and Minister of Rugby World Cup Murray McCully. 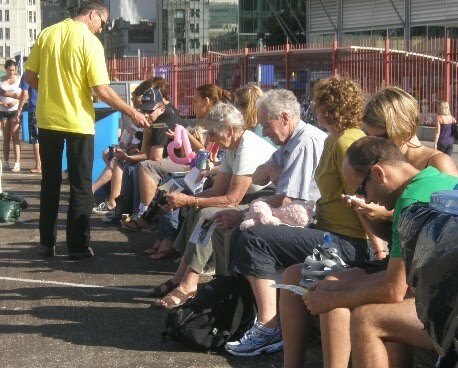 Despite little advertising the wharf was thronging with people. Where did they all come from? Hard to say. 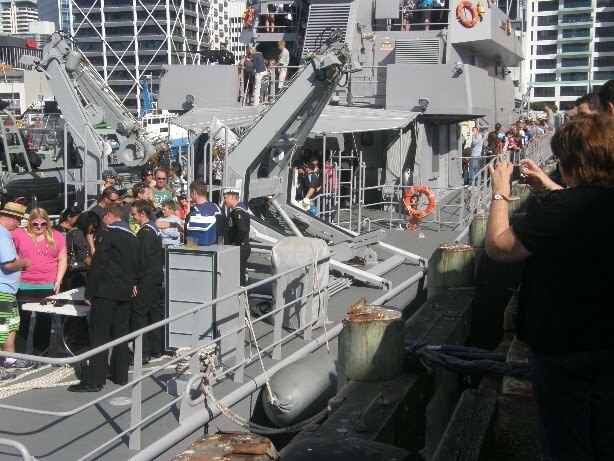 Just came down town after Anzac Day looking for something to do, and saw there was something up at Queens Wharf Party Central and headed on down. Yep. Dancing tugboats. Something for everybody. 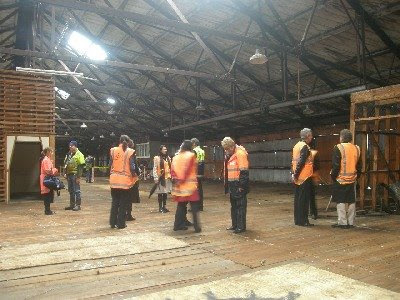 The temporary ceiling is there, now, with strip lighting - fairly institutional - for when Shed 10 is used as cruise ship terminal which happens at the moment when Princes Wharf has a cruise ship. TV was interested in the view of architects about the sheds. Their leaflet reads: "...so as you walk around this place of our history ask yourself, is today the day we wash away our reminders of yesteryear? Is today the day to sign the destruction of our choices? Is today the day we should be dismantling our heritage? 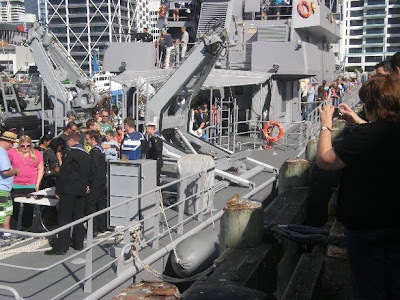 Once it's gone we can't get it back..."
The big attraction on the day was undoubtedly the Navy. Their ship attracted huge amounts of attention. Everybody wanted to be shown around. It got tiring in the sun. There are quite a few old timbers around to sit on, and the sheds were great shelter from the sun. These big timbers make great seats. And they all seem to be in the right place. As I sailed back to Devonport in the ferry, it was great to look back and see people on the peoples' wharf. Walking around the sheds. Enjoying their newest Regional Park. It was a great step of ARC and Government to buy this wharf and everything upon it. It's no longer a restricted area that we have to keep out of. Too much emphasis on a future cruise ship terminal could shut this place down again - as the security demands and worries about risk - force the big fence to be locked and the gates clanged shut. 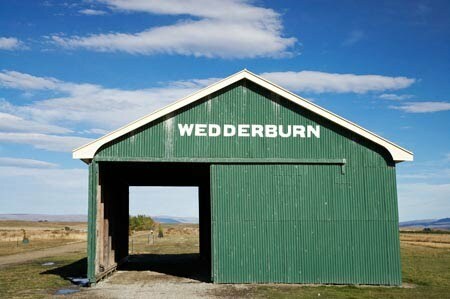 New Zealand loves its sheds. Corrugated iron ones especially. This rail shed is an iconic part of the Otago Rail Trail - one of New Zealand's tourism success stories. They make great paintings. Iconic paintings and images. Recalling our history and our attachment to it. Grahame Sydney painted this one. 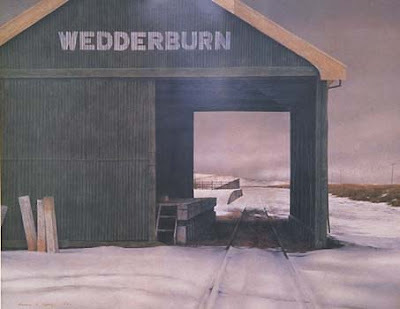 And all over New Zealand, when the old shed gets a bit too tired, because the galvanize has failed and there's not been any paint around, you can always replace it with another one. But the old one remains. A memory. Or just plain old black and white - a black one and a white one. And then you can add the fern. 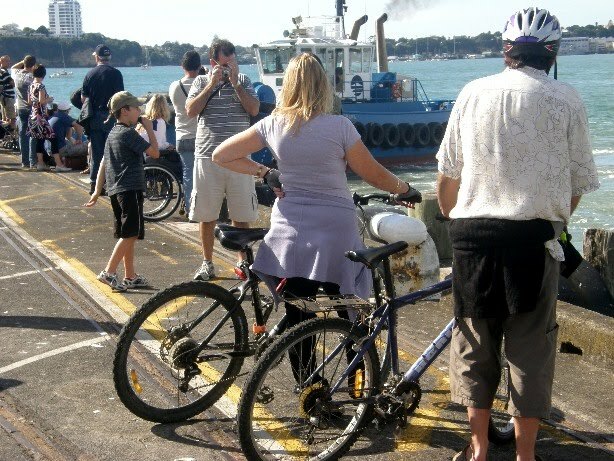 Great look for Auckland and the visiting cruise ships. Don't demolish them. Re-use them. Go down there on Sunday. This Sunday the 25th April. 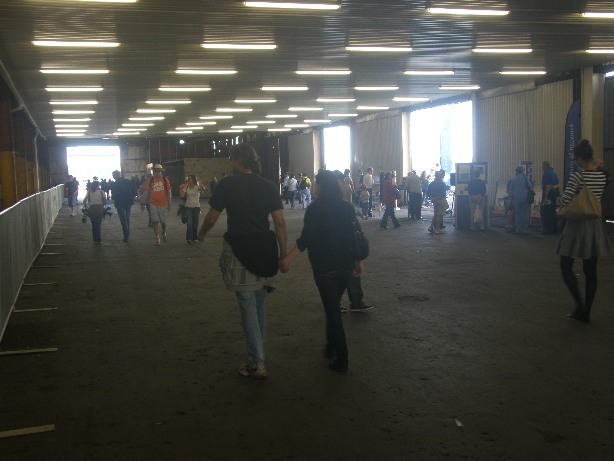 The sheds are open to view on Queens Wharf from 1:00pm to 5:00pm or so, and it's party time down there. Acts, theatre, food, fun. Bring the family. 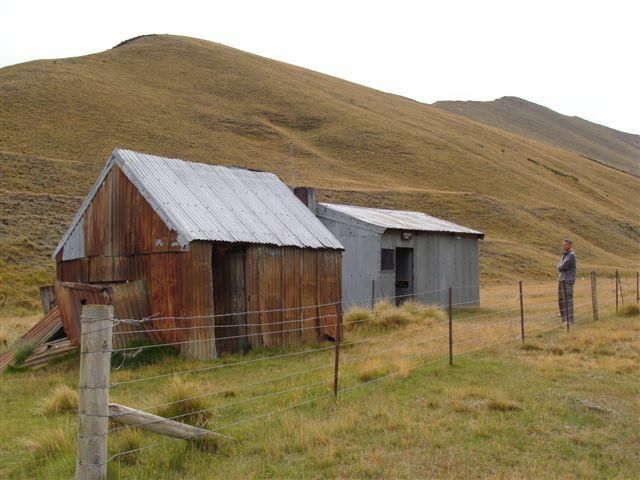 Make your claim to these iconic New Zealand sheds. Can We Trust The Historic Places Trust? 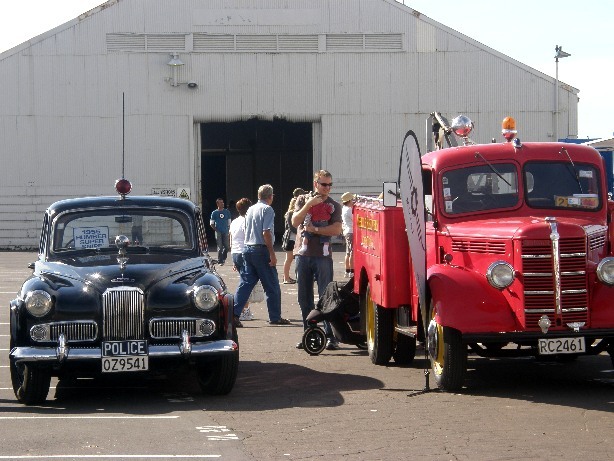 On Friday 16th April, or thereabouts, Auckland Regional Council received a bombshell from the New Zealand Historic Places Trust - or more correctly from the Auckland Branch of the Historic Places Trust. 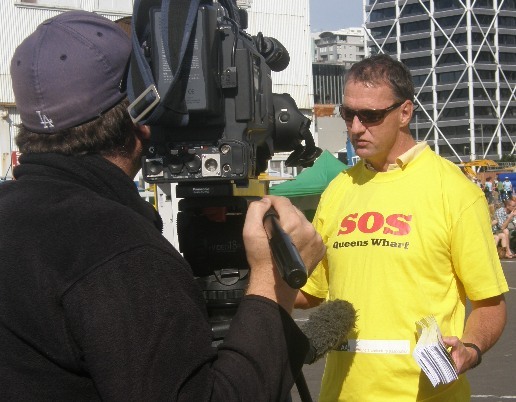 The letter was a bombshell because it signalled a strong interest from NZHPT in Queens Wharf and the sheds, and it was a bombshell because it arrived just in time to influence ARC decisions relating to its proposals for Queens Wharf. - NZHPT "preliminary investigations indicates that the place has significant heritage values..."
- ..."given the heritage value of the place, both formally recognised and that identified by the Matthews and Matthews Assessment we would recommend to ARC that an heritage impact assessment is now undertaken in regard to ARC's preferred option for redevelopment, whether this involves adaptive re-use of some or all of the buildings and wharf, or total removal of the warehouses and modifications to the wharf..."
The letter was signed by Sherry Reynolds, General Manager Northern HPT. after the 2011/12 cruise season. cruise ship terminal for the 2011/12 cruise season. 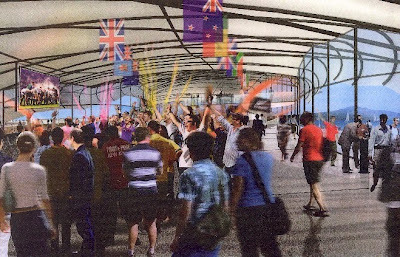 b) That the Council approves the staged dvelopment of Queens Wharf to enable its use as fan zone, visitor centre and public open space for Rugby World Cup 2011, and for the construction of the permanent cruise ship terminal to commence immediately after the 2011/2012 cruise season. (i) approves, subject to the outcome of consultation with the New Zealand Historic Places Trust, the dismantling of sheds 10 and 11 on Queens Wharf as required and the storage of materials to maximise re-use in the development, and authorises the Chief Executive to obtain the necessary consents to carry out the work. (ii) works with the New Zealand Historic Places Trust to complete a heritage assessment of Queens Wharf and its structures with the aim of recording its heritage, maximising the retention and integration of heritage features on the wharf into the development, re-using materials form the sheds and ensuring that appropriate interpretation of the history and heritage of the wharf is reflected in the development of the wharf. Regarding these recommendations - you may be wondering, what's the difference? 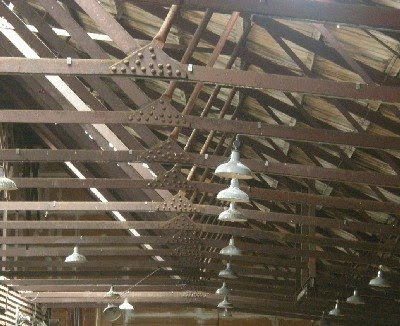 The key difference is that the ARC's approval to dismantle (for which read: demolish) the sheds was "subject to the outcome of consultation with the New Zealand Historic Places Trust". And reading its letter you could be forgiven for coming to the view that the NZ HPT was actually serious about Auckland's waterfront heritage. 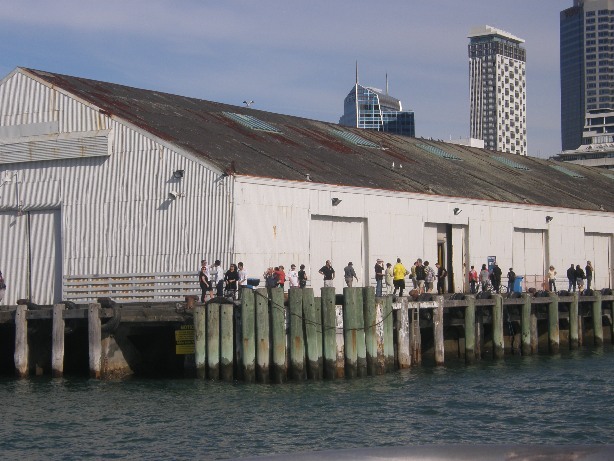 The decision to demolish the two Queen’s Wharf sheds has been met with disappointment by the New Zealand Historic Places Trust. 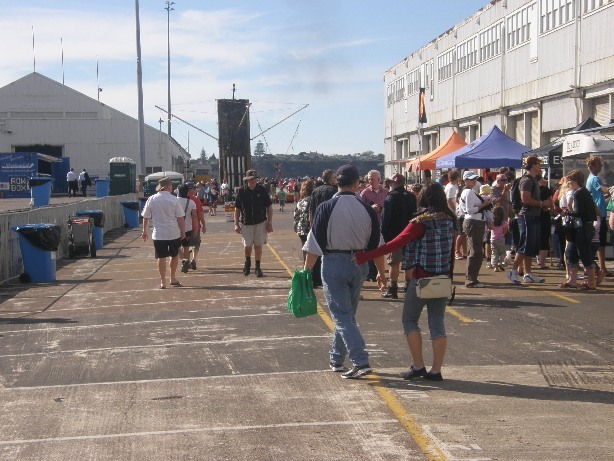 “We would have preferred that a use be found for the sheds as part of the overall solution for this area, as it is an important part of New Zealand’s maritime history that will be lost,” said NZHPT Chief Executive, Bruce Chapman. “Ways to adaptively reuse these buildings could have been explored, and we would have been prepared to support quite substantial changes to ensure as much of the buildings could be retained as possible. The NZHPT had been considering registration of the Queen’s Wharf, however will not be proceeding with this. Mr Chapman said the organisation would still like to have the opportunity to record more of the buildings’ information prior to their loss. You will note that this media release came from the Chief Executive, Bruce Chapman, who is based in Wellington, in the NZHPT's head office. You really wonder why New Zealand would bother with an organisation that is so spineless at National level, and so unsupportive of genuine preservation work that its Regional Office was carrying out in Auckland. So unsupportive of their initiative which had been taken seriously by ARC, and was being acted upon. As you can see. 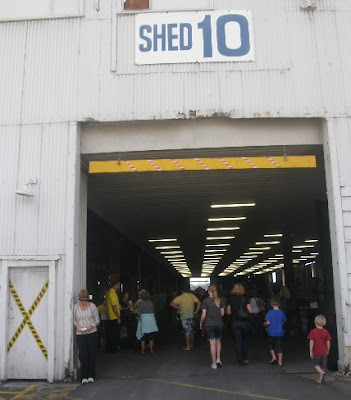 And right now these sheds, Auckland's heritage, needs all the help it can get. The pressure and speed to dismantle/demolish must be slowed so good sense can prevail. But really, if we can't trust Auckland's heritage with the NZ Heritage Protection Trust, and we certainly can't trust ARC, who can we trust? The word "hypocrisy" is being uttered in undertones up and down ARC corridors. 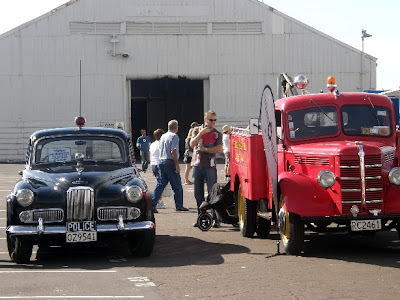 The Auckland Regional Council is Auckland's main heritage guardian. It has gone to war on several occasions while I've been on Council. It spent hundreds of thousands in expert evidence and legal advice protecting maori dump sites (middens) and colonial earth works at Long Bay. This applied energy means that the private land owners of that land cannot, now, develop that land or urbanise it. And I supported that action. New Zealand - and Auckland especially it seems - is very short of heritage and history because it has a habit of destroying it. Here, ARC has made private owners of those buildings jump through all kinds of hoops if it is their wish to develop their land. 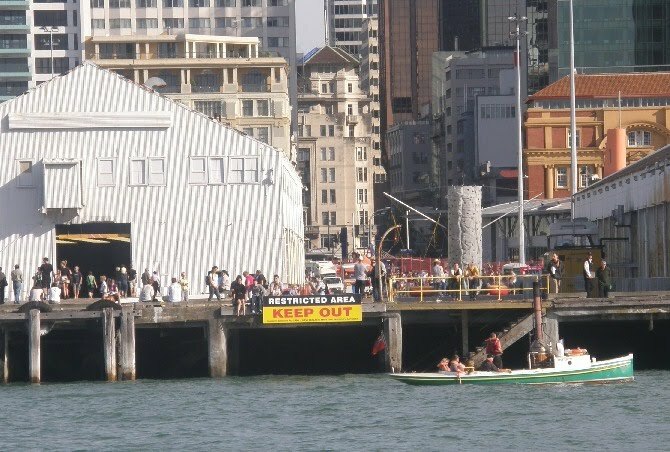 Yet here we have Queens Wharf, in public ownership now for about 2 weeks after transferring the wharf from Ports of Auckland ownership to ARC and Government, and we have the extraordinary activity of ARC - owner and regulator - pushing with huge haste for the demolition of cargo sheds which were built not before second world war - these sheds were built before the first world war. 1912 I am advised. "Practice what you preach" - was a phrase used by more than one ARC councillor in the debate that occurred this Monday in at the ARC. But to no avail. If it was not for the letter from the Historic Places Trust - calling for a proper heritage assessment of wharf and structures - the vote to approve dismantling would have been a doddle. As it is, ARC's decision to dismantle is subject to the outcome of consultation with the Historic Places Trust and presumably to it carrying out its own Heritage assessment. The word "dismantle" is now being used instead of "demolish". The Chair of ARC has begun using it lately. One or two ARC councillors like it too. There is talk of using some bits and pieces of the dismantled shed - as a sort of aide memoir of what is there now. Bit like takling the best bits of a Model T Vintage car and blending them into the construction of a brand new Holden - made of carbon fibre, or plastic. That is the argument that was used to mitigate the Princes Wharf design. 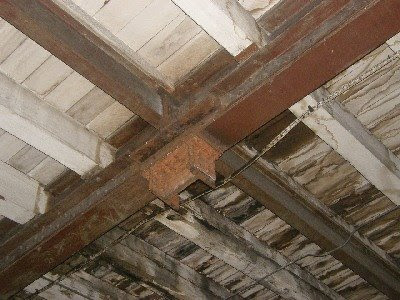 They said they'd reuse some of the old building structure. You can vaguely make it out buried underneath the Hilton Hotel and the Apartments. But it is tokenism. Facadism. Sad. report also requires the removal of both sheds before the Rugby World Cup. requirements of the site as a cruise terminal, and the major uncertainty over the cost of attempting to modify them, mean that they obstruct both the short term and long term development of the wharf and that, on balance, they should be removed. retention and integration of heritage features on the wharf into the development, reusing materials from the sheds and ensuring appropriate interpretation of the history and heritage of the wharf is reflected in the development of the wharf. 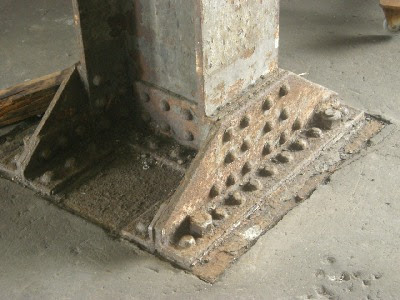 dismantled to maximize the recovery and reuse of materials in the development. Spot the difference - is my challenge. So. ARC got a very clear steer from the heritage report that it commissioned. It got very clear advice from its own expert staff. But it got all boiled down to "dismantling" by the Chief Executive, no doubt in cahoots with ARC's Chairman. Practice what you preach guys. Can you help? Do you want to? 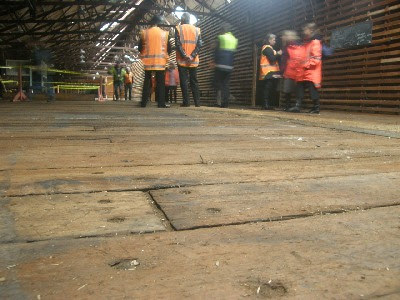 It is extraordinary that the Historic Places Trust has so completely and utterly capitulated on the Queens Wharf sheds. It is unclear from its statement whether it is even interested in going ahead with the heritage assessment it recommended the ARC to carry out in a letter dated 15th April. I wonder what happened between Friday and Tuesday? No matter, as mentioned elsewhere in these blogs, a very robust heritage assessment has already been carried out for ARC and Auckland City Council by Matthews & Matthews Architects. That has credibility and detail. So what else is there to consider? Well it seems to me that the ARC has duties in terms of the RMA that are wider than simple compliance with a plan - be it the Regional Plan Coastal which has not been updated since the transfer of Queens Wharf into ARC's ownership. Thin ice is what is being skated on here. There is already talk of judicial review proceedings. But maybe a Declaratory Judgement is needed first. One that tests what ARC's duties are in respect of Queens Wharf, and in terms of the planning process that should unfold now. I suggest this because I get the sense Govt and ARC want to just go ahead and do their worst without due process. Get away with minimum. What might be best practice? Did you know - for example - that Sea + City is doing some work now on North Wharf? It has been preparing the wharf structure, and is building some new structures alongside the net shed, and is managing the stormwater from the area etc. 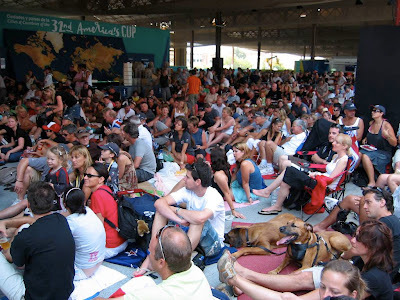 Today at ARC, we were advised, as a formaility, that Sea + City had applied for resource consents relating to: public seats on the wharf; stormwater drainage from the wharf; and other matters. I asked a question about this, and was advised that Sea + City were keen to do the "right thing" when it came to consents for these works. It recognised - for example - that public seating on the wharf was not a permitted activity - in the relevant zone. So that is why it applied for consent. 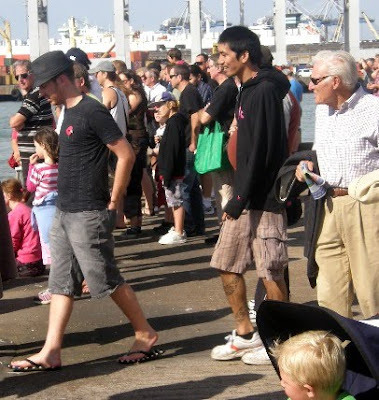 It also applied for consent to allow promenading! But ARC officers advised that was not necessary. This was a fully notified consent. Sea + City did the right thing. 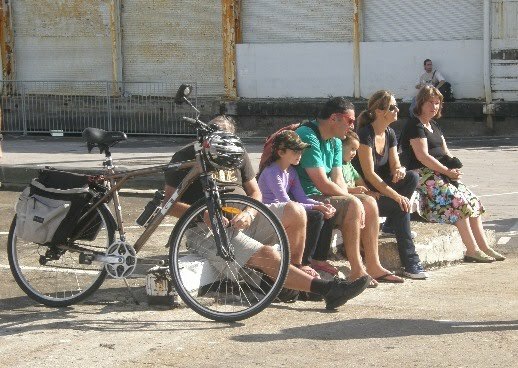 I mention this, because it raises issues about what the permitted activity status is on Queens Wharf. This seems to be still "port activities" of some sort - and not things like public seating, or presumably bars and cafes and party time. That is most likely why the powers that be keep emphasising that what they want to build is a "cruise ship terminal" and why the references to "party central" and partying and related activities are being down-played. All those people. All that drinking. All that pedestrian traffic. All that noise and fun. All those generated effects that normal business es would be required to have carefully crafted conditions of consent sorted out through a notified planning process. Because the port zoning does not provide for these activities. If you were a private operator you'd be required to get a consent for any activity that was not provided for in the plan. And while I'm on the topic, what do you think happens to the stormwater from Queens Wharf and the buildings there? Not sure.... neither am I. But it's the ARC that consents those direct discharges into the harbour, and they need to comply. Another item cropped up on the council agenda today. 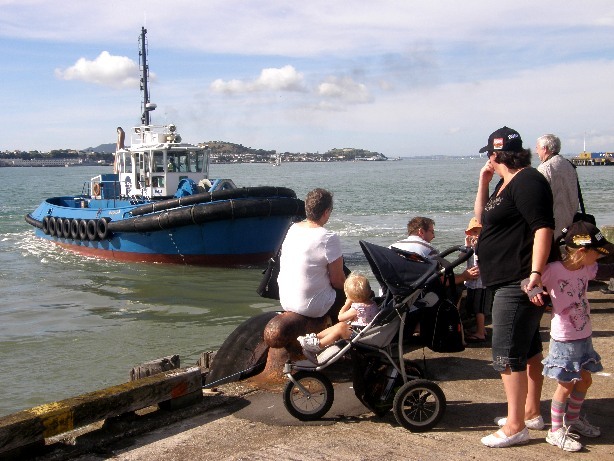 It related to works being carried out on the wharf at Cornwallis - an ARC regeional park fronting the Manukau Harbour. The works required are pretty minimal, but they are not provided for explicitly in the plan. The report councillors received receommended: "...to avoid a perceived conflict of interest, as the ARC is the applicant, it is recommended that an independent commissioner be appointed to review and make decisions...."
I think that what is good for the goose, should be good for the gander. I think the ARC is making itself vulnerable to a legal challenge in respect to its compliance with its general duties under the Act. Is there anyone out there who agrees, and would like to assist further? Queens Wharf - Has it come to this? 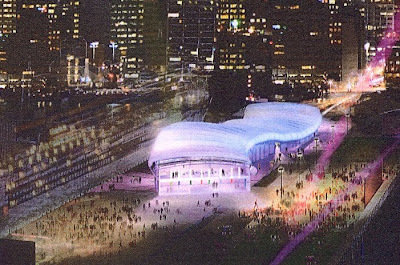 So here we have Queens Wharf, as ARC and the Government - according to its joint media release - would like it to be. The glowing thing is the plastic structure - aka the tent. Though we are told it is not a tent. 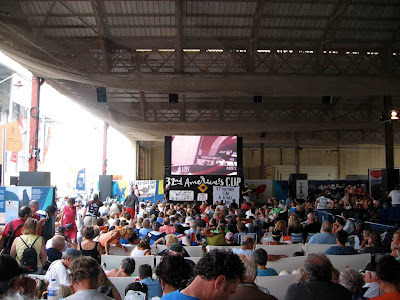 It is a temporary structure that is not a tent. This is their conception of how it might look on the inside. A fairly transparent structure. One that can be taken down and relocated after the event. I think Auckland will love hosting a Party Central. 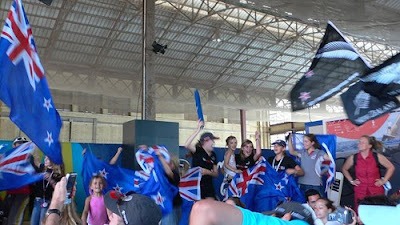 We did it during the America's Cup. 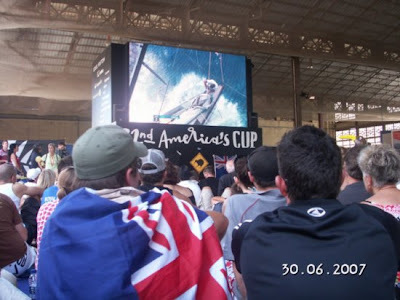 Here's a picture of how they hosted America's Cup Party Central in Valencia: The Woolshed. A real kiwi idea. This facility worked really well in Valencia. People loved it. It would work well on Queens Wharf too. In the old sheds. Have you been on Queens Wharf yet? Have you been inside the Sheds? Have you experienced the views? Hardly anybody has. So go donw there this Sunday. Anzac Day. And have a good look.